If you decided to go solar a while ago and you’re thinking about going solar with more of your appliances or devices around the house, a solar charger that works for more than just one of them is the natural choice for you. There are many shapes and sizes of solar chargers out there and you can choose the one that fits the best your needs and devices. From the freestanding cells to the ones mounted on your backpack, the solar chargers present various power capacities and therefore, have various prices. What’s great about the solar chargers is that you may keep your USB devices full of juice without depending on a main power supply or a battery. The solar chargers have changed so much over the years and you may find now pocket-sized, highly portable models, but also the strong set-ups that you may take camping or in places where electricity is impossible to have. You need to check the ratio of power to smartphone battery life if you’re looking for a solar charger for your phone, or the output. No matter which model you go with in the end, keep in mind that you always need real sunlight for the solar charger to charge. Go for the chargers with large solar panel that is able to get maximum sunlight fast and easy every time. You may want to clean it, carefully, from time and to expose it directly to the sunlight, as even some glass may lower its performances. Are you the avid hiker that needs a solar charger but you got not much money left after buying all that gear? Take a leap of faith with the Solar Charger, GRDE 10000mAh Dual USB Ports IP67 Water-Resistant Portable Solar Power Bank Phone Charger and give it a go next time you’re hiking. The solar charger has a 10000mAh battery built-in, so it’s powerful enough to charge your iPhone up to 3.5times. 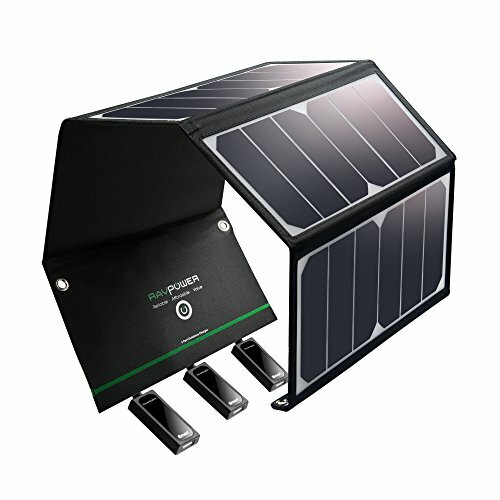 the solar panel is compact and the micro USB cable that comes may be used for charging it straight in direct sunlight. The dual USB output charger ports make it more versatile and they come with cover, protecting your devices while charging. The outputs accommodate most digital devices, identifying automatically what kind of power do they need. Additionally, a five pilot lamps lets you know about the status of the power bank. 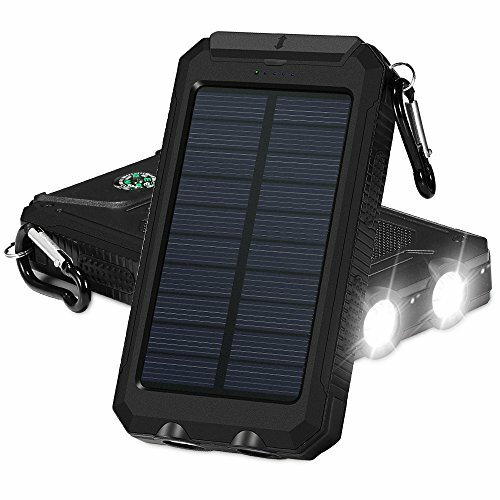 The design is well thought out and the solar charger has 2 LED flashlights that are bright and dependable. The flashlight has 3 light modes: steady on/SOS and strobe so you may use it according to the situation. The power charger comes with a compass and a carabineer/hanger, for more portability. The heat dissipation is efficient and the solar charger has an IP67 water-resistance grade. It’s also dust-proof and shock-resistant, which makes it great for the outdoor experiences. Lightweight, compact and dependable, the solar charger is great for any hiker. Regardless of the minor problems, we still think the solar charger is a great tool for the adventurous type. 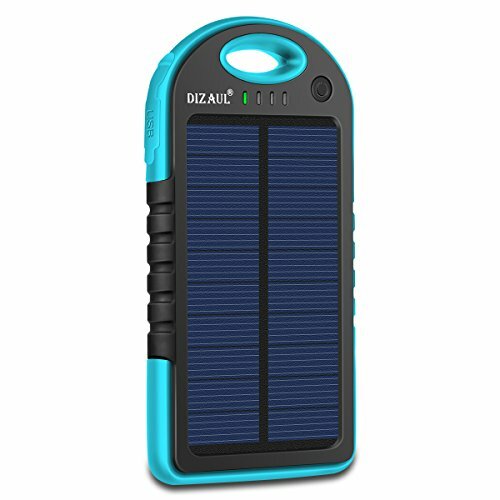 The Solar Charger, Dial 5000mAh Portable Solar Power Bank is a great choice whenever you want a solar charger but don’t exactly have a generous budget for it. Made of eco-friendly silicone rubber, ABS +PC material, the solar charger is a dependable charger for the outdoors, taking a fall and the heavy intense use. The rubber paint surface process counts a lot when it comes to its durability, for sure. Add the football grain design that gives an anti-skid protecting effect and the water-resistance, and you get a solar charger that doesn’t disappoint even when it’s raining. The shock-proof feature makes sure the solar charger takes a fall. The free hook increases the portability of the charger so it’s easy for you to hang it when backpacking, hiking or camping. The design is well thought out and the USB ports are protected by rubber caps, making sure no water gets to your charging smartphones, tablets or other 5V USB-charged devices you’re using. The solar panel is a bit limited which is why you need more than 24 hours to fully charge the solar charger. You may, though, use the wall charger instead. Lightweight and easy to carry, the charger is easy to use and looks rather nice too. All in all, considering it’s portable, shock and water resistant, but also reliable in many situations, the solar charger comes at a steal price which you can’t say “no” to. 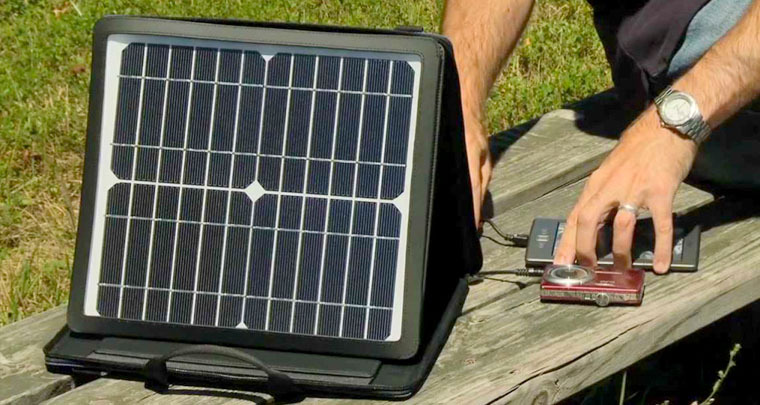 Well-made and highly portable, the Solar Charger RAV Power 24W Solar Panel with Dual USB Port is a great solar charger that is efficient, converting up to 21.5-23.5% of solar power into free energy. The design of the solar charger is well thought out and you may charger two USB devices at the same time. The compact size of the charger makes it easy to carry it around and to store it. It features 4 key-holes that keep it in place while backpacking, staying in place even when you’re on the move. The solar charger is also foldable so no worries about carrying it/storage either. The iSmart technology on the charger means it automatically adjusts to your devices, giving them the most efficient charging current, while lowering the charging time. The Smart IC frequency also identifies all the connected devices input, distributing current output the right way, for up to 4.8A. When we take a look at the build, we notice the waterproof sewn tough polyester canvas that gives a weatherproof charger. Easy to take with you whenever hiking, backpacking, cycling or any other outdoor activity you’re into, the solar charger is durable and efficient. Nevertheless, for the good build, versatility, portability, and efficiency you should give it a go if ever in need. 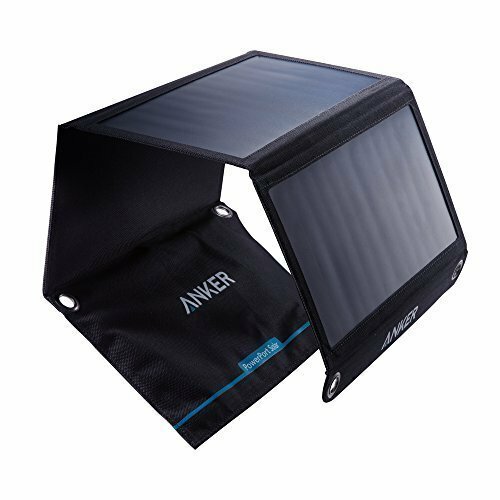 One of the most popular choices out there, the Anker 21W Dual USB Solar Charger, PowerPort Solar brings many good things to the table and only few minor issues need to be improved. The solar charger is made with PowerIQ technology that ensures fast charging, up to 2.4amps per port or 3amps overall, but it needs direct sunlight for this kind of performance. The 21watt SunPower is 21.5-23.5% efficient, ensuring enough power to charge two devices at the same time. The build leaves a durability feel and that’s because the charger is made with tough PET polymer, whereas the solar panels are sewn into a rugged polyester canvas. Shortly put, the charger is weather resistant and takes the use in the outdoors. The portability is high and the charger doesn’t just have a compact shape and just the right size for easy carry, but it’s also lightweight, featuring stainless-steel eye-holes on each corner. This design lets you attach it in no time to your backpack, tent or the nearest tree. Add the ultra-thin design and you get a charger that doesn’t add much weight at well, even when your hiking for many hours. The 2-port charger comes with a 3ft. Micro USB cable and a useful guide too. Unlike other solar chargers, the Anker is also charging through the window glass. On top of everything else, it looks very nice so it’s quite a winner on so many levels. Nevertheless, for the good build, portability, thin profile, compact size, and so much more, we wouldn’t change our mind about getting it. 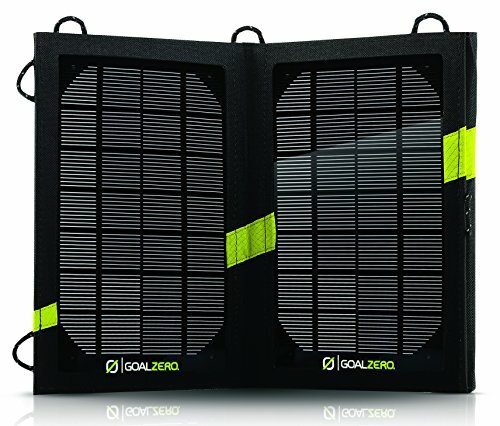 Even though this isn’t the cheapest solar charger out there, the Goal Zero Nomad 7 Solar Panel is worth every penny, but you need to go over its detailed description to get it why. The Nomad & charges directly most USB and 12V devices, from cell phones, smart phones to MP3 player and GPS. A great feature of the charger is that you may connect it to other Goal Zero products: Rock Out portable speakers, Guide 10 Plus Rechargers, Goal Zero Switch 8&10 Recharger, Flip 10&20 Recharger, Venture 30, and Lighthouse Lanterns. The build of the charger turns it into a portable and easy to store device. The solar charger is easy to fold, whereas its tough construction makes it able to take the intense use. it’s weather resistant, so you won’t have any problems with it handling the more difficult weather conditions. You may use the USB and the 12 V ports at the same time as the Nomad 7 is going to divide the incoming solar power between the two ports, charging them altogether. The solar charger is also lightweight, so it’s not only easy to fold, but also easy to carry around. Its compact shape eases you carry and use. Well-made, with good connectors, the solar charger has great power, considering its size and leaves a durability feel to it. It charges fast and it’s easy to connect with other solar chargers. Nevertheless, for the lightweight, compact shape, portability and all the other features, you may see the Nomad 7 as a great investment of your money.